I’ve got a French picture book import for you today, dear Imps. 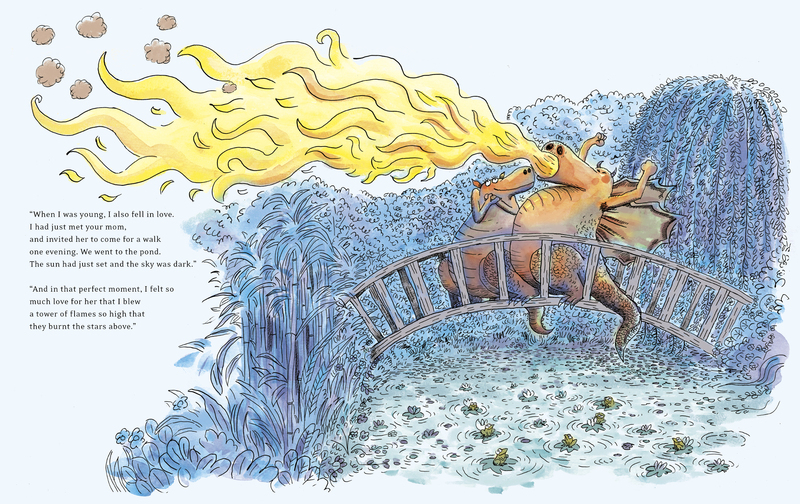 This story, written by Alexandre Lacroix and illustrated by Ronan Badel, was originally published in 2014 and was translated by Vanessa Miéville. 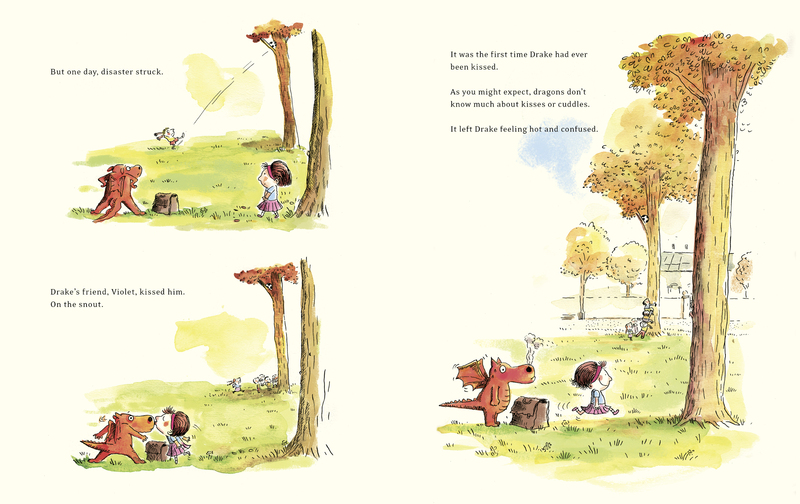 Dragons in Love (words & pictures/Quarto, January 2019) is all about the thrill (and maybe heartache) of first love. 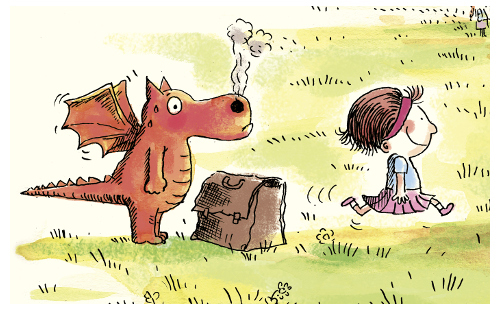 This is the story of a little dragon named Drake. He often heads out of his cave, where he lives with his father, to play with the human children in the local playground. 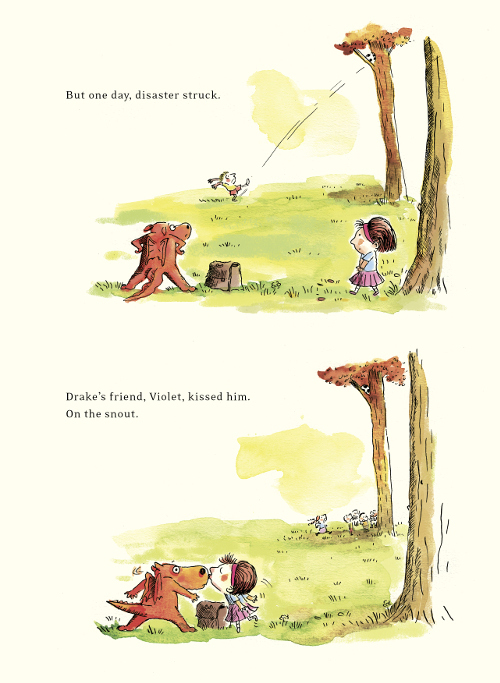 One day, “disaster struck.” One of Drake’s friends, Violet, kisses him on the snout. This is Drake’s first kiss, and he is left feeling “hot and confused.” Panicking, he flees. He is distraught that — despite liking the kiss (“In fact it felt soft”) — he can harm Violet if he were to ever kiss her back. He is a creature who breathes fire after all. He decides he’ll have to avoid Violet. 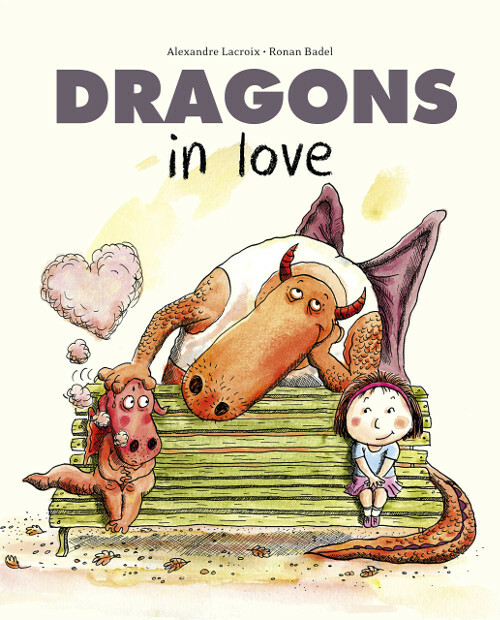 DRAGONS IN LOVE. English language edition © 2019 Quarto Publishing plc. Original edition in French by Flammarion © Flammarion 2014. Translated by Vanessa Miéville. Illustrations reproduced by permission of the publisher, words & pictures/Quarto, Lake Forest, CA. 1) I was sad to hear about Mary Oliver’s passing, but I’m filled with gratitude for the gifts she left her readers. 2) It has been quite the sight to see all the tributes to Oliver this week and people talking about how much her work meant to them. 3) This whole thing made me sick to my stomach, but it’s good to see the outpouring of outrage over such vile, despicable behavior. 4) Dinner with friends and good conversation. Can people tweet ways we can help the #FederalWorkers #FederalEmployees and their families struggling under the weight of this government shutdown? Hi, I’ve been spacing on Sundays. I think this is a perfect book for all dragon lovers. Those facial expressions. Thank you, Badel. Jules, It’s been quite amazing to read all the Oliver tributes this week. It’s quite the loss. 1. Saw Andy Borowitz on Friday. He was great. Laughed so much. And he offered complimentary tickets to furloughed workers. 2. Book club last week. Discussed Prairie Fires by Caroline Fraser. A fascinating book about Laura Ingalls Wilder. 3. Finished Mary’s Monster by Lita Judge. It’s a CYBILS final. 4. Started a writing class with the author, Emily Whitman. 7. Daylight is arriving earlier. 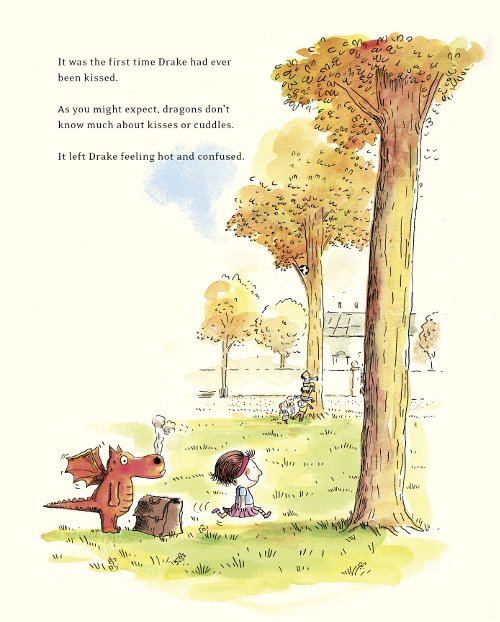 Drake is definitely an adorable dragon, I love these illustrations and the wonderful expressions on all of the characters, especially the illustration of the first kiss. 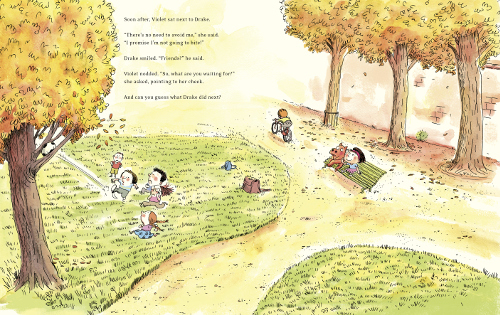 Jules – dinner with friends with good conversation is always a kick, and the tributes to Mary Oliver have been wonderful to read. Do you ever make your playlists on Spotify? Jone – so jealous you got to see Andy Borowitz! Glad it was such fun! I’ve been hearing a lot about Prairie Fires, will have to put it on my to-read list. Big hooray for daylight coming earlier. LW – Loving all your kicks, especially Rest, Kindness and Compassion. 1) Getting a copy of The Lost Words by Robert MacFarlane and Jackie Morris for my nephews and 1 for myself. 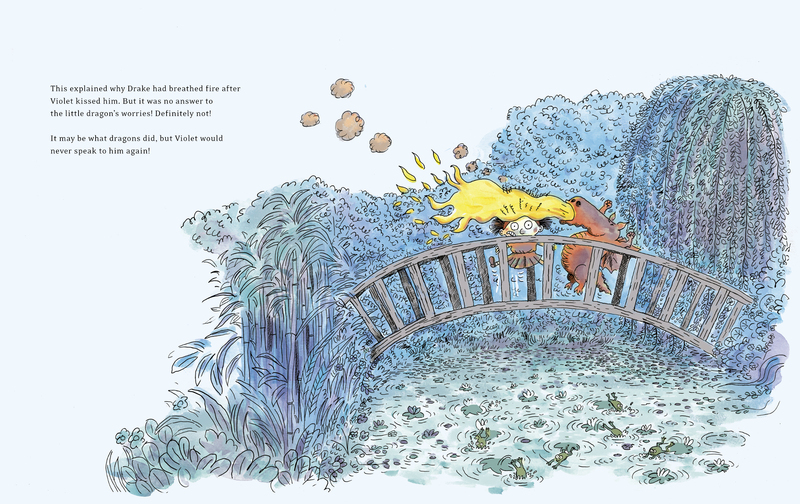 Such a beautifully illustrated book. 2) My nephew loved the book Rhymoceros I sent him so much he asked to take it to school the next day. 3) Busy work week, and thankfully productive, too. 4) Finished watching The Newsroom, such a good series. 5) Time for a much-overdue massage. Aaahhhhh. 7) Getting to come home to sweet Daisy. Thank you for sharing the work of Ronan Badel and how wonderful there are other books with the same characters. We can all use some laughter after this past week. I think it’s great you’re working on a playlist, Jules. I need some new music to write to. Jone: I love Lita Judge’s Mary’s Monster. 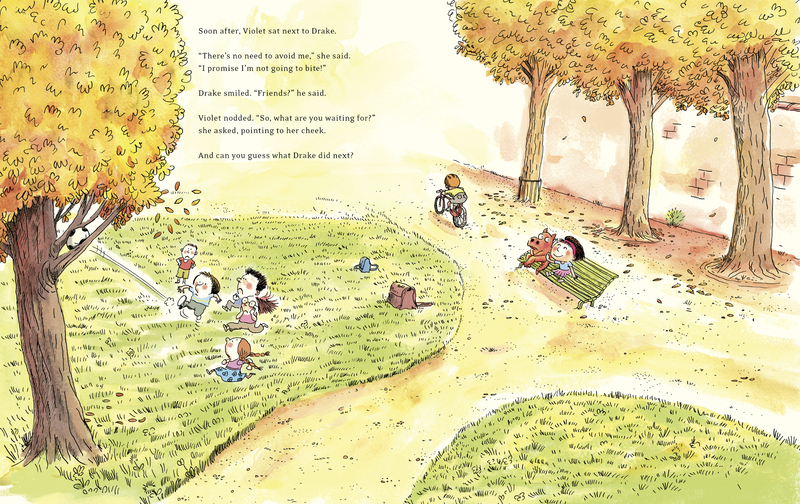 Little Willow: We can all use more doses of kindness and compassion. Glad you had some. Rachel: Happy you enjoyed a massage. That sounds heavenly. Jone, enjoy your writing class. Writing being re-energized sounds good. LW: That’s one of your best kicks free verse poems yet! Rachel: Nope, I don’t use Spotify, but I probably should look into it. So glad you got The Lost Words. It’s gorgeous. Also, yay for Rhymoceros. Margie: What good, solid, lovely kicks. We actually got a tiny bit of snow this morning. Speaking of your fifth kick, maybe we can all see the super blood red moon tonight (or whatever it’s called). Have a good week, you all! This book looks absolutely adorable! Thanks for sharing these wonderful illustrations with us!